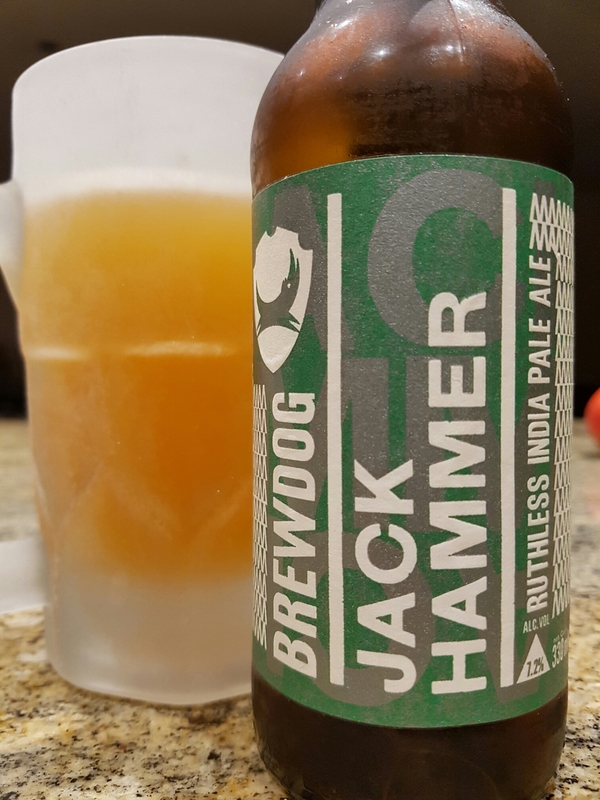 Jack Hammer Ruthless IPA – Brewdog (Scotland) | Justintoxicated. Start with a colossal grapefruit aroma. Pile on bitterness after thumping bitterness, and ride the anarchy wherever it takes you. The caramel razor is sharp, but the resinous bite drills straight through your taste buds. Visual: Pours marmalade orange with large suspended bits, a very small dissipating head, thin ringed retention with spotty islands, slow sporadic streams. Summary: A really, really nice showcase of a quality IPA. Balanced sweet grapefruity malts with a superb smooth-thick mouthfeel, and the hops are bold yet never overbearing. I particularly like the re-emergence of the barley malt at the finish. Very round and profound. Recommended.